Norwegian Cruise Line today unveiled a major innovation in ship design: The Waterfront and 678 Ocean Place on its newest ship, Norwegian Breakaway, launching in April 2013. This new concept includes an oceanfront boardwalk lined with shops, restaurants and bars, combined with three expansive, flowing decks of dining, bars, entertainment, gaming and more. The Waterfront and 678 Ocean Place will take cruising to new heights and offer an unparalleled experience with a unique connection to the ocean. "With our newest ship, Norwegian Breakaway, we are continuing our tradition of innovation with a brand new ship design that will provide our guests with a unique experience unlike anything else at sea," said Kevin Sheehan, Norwegian Cruise Line's chief executive officer. "The heart of Norwegian Breakaway and the elements that truly set it apart are The Waterfront and 678 Ocean Place. Guests will enjoy al fresco dining while admiring the beauty of the ocean, along with the excitement and exhilaration of three expansive action-packed decks, as everything is designed to flow seamlessly." Located on Deck 8, The Waterfront is a revolutionary outdoor experience that adds a whole new dimension to the line's signature Freestyle Cruising, by offering a number of seaside venues that feature breathtaking views and a sense of connection with the ocean. 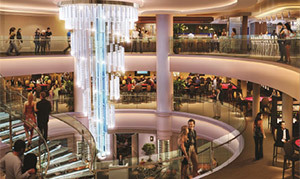 The hub of the ship is 678 Ocean Place, a space that uniquely flows, intertwines and connects three decks of daytime and nighttime amusements. There will be a total of 17* dining venues combined on both 678 Ocean Place and The Waterfront, along with 12* bars and lounges. Norwegian will also introduce a new dining concept on Norwegian Breakaway, Ocean Blu, the line's first ever all-seafood restaurant, which will include a premium raw bar, along with a separate sushi bar. The Waterfront will feature eight outdoor dining and lounging options, including signature Norwegian favorites like Moderno Churrascaria; Cagney's Steakhouse; La Cucina; Shaker's Cocktail Bar; Malting's Beer & Whiskey Bar; and the newest addition, Ocean Blu on The Waterfront, with outdoor seating and a special takeaway menu. The Waterfront will also feature another first for Norwegian - a gelato bar serving a selection of flavors of the delectable frozen treat. 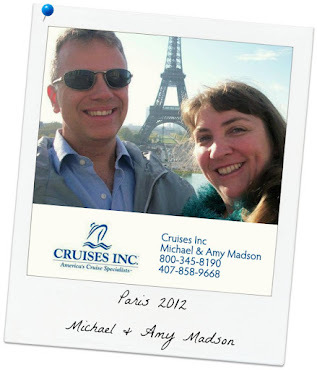 Guests will enjoy this creamy confection as they take a leisurely stroll along The Waterfront. A yet-to-be-announced entertainment venue will also have an outdoor space. On Deck 8, 678 Ocean Place connects the excitement of The Waterfront outdoor spaces with interior dining venues for Moderno; Cagney's; Shaker's; La Cucina; Malting's and Ocean Blu, including the raw and sushi bars. An elegant modern take on an ocean-inspired theme with a glamorous feel, Ocean Blu is the newest addition to Norwegian's Freestyle Dining lineup. Featuring a premium raw bar and a sushi bar, Ocean Blu will offer seafood lovers a culinary treasure. "In a recent guest survey, our guests chose a seafood restaurant as the number one type of restaurant they would like on board our ships," said Sheehan. "We listened to that feedback when planning the dining on Norwegian Breakaway and will launch Ocean Blu as our newest signature restaurant concept." La Cucina celebrates the Tuscan countryside and will continue to serve Norwegian's delicious Italian dishes to guests who choose dine either al fresco on the outdoor patio on The Waterfront, in the main restaurant or the interior terrace option, giving guests the opportunity to dine along the interior walkway beneath twinkling lanterns, exposed wooden beams and greenery. Moderno Churrascaria is Norwegian's signature Brazilian-style steakhouse. Whether guests dine indoors or out, they will feast from a huge salad bar, followed by a variety of grilled and slow-roasted meats that are carved tableside by passadors. Overlooking the Manhattan Room is another Norwegian signature establishment, Cagney's Steakhouse, which will feature succulent grilled steaks, perfectly cooked double cut lamb chops and other steakhouse favorites. Guests will dine in style amidst warm wood tones as they enjoy watching the chefs prepare their meals in the open kitchen. Located between Cagney's and Moderno, Prime Meridian will offer guests the opportunity to order a signature cocktail and soak in the action taking place around them on 678 Ocean Place. 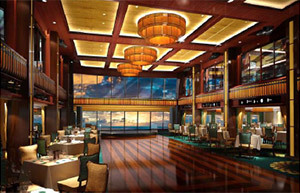 Guests will also find retail outlets, the photo gallery, and the Humidor Cigar Lounge on Deck 8. A three-story open atrium with an exquisite LED chandelier with light changing effects will serve as the centerpiece of 678 Ocean Place with openings to all three decks and glass staircases connecting the levels. Spanning more than 18,000 square feet on Deck 7, the contemporary Breakaway Casino will have a stylish sophistication created by the use of rich materials, luxurious ornamental lighting and highly decorative artwork including gold tiles and upscale finishes. Breakaway Casino will offer guests the opportunity to try their luck on more than 300 of the latest slot machines; along with 26 gaming tables featuring poker, black jack, roulette and craps. With the most rewarding Casinos At Sea Players Club program, there will be something for everyone, from the novice to the high roller. Bar 21, located adjacent to the Casino, is a stunning, intimate bar featuring video poker and multiple plasma television screens. Reminiscent of a private New York City supper club, The Manhattan Room is a complimentary restaurant on Deck 7 that will feature a dance floor as its focal point. As guests dine on cuisine that reflects the elegant and romantic nature of the room, they will enjoy live music and dancing. The two-story high restaurant showcases floor-to-ceiling panoramic windows looking aft. Due to the popularity of the noodle bar on Norwegian Epic, Norwegian Breakaway will feature Shanghai's Noodle Bar, the largest noodle bar at sea. This exciting dining concept will offer all counter seating around an open kitchen and will serve traditional Chinese noodles, wok-fried dishes and dim sum. 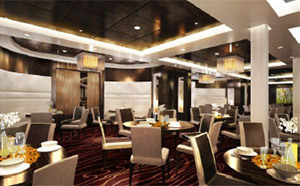 Another guest favorite, O'Sheehan's Neighborhood Bar & Grill, returns on Norwegian Breakaway. This complimentary 24-hour a day neighborhood sports bar and restaurant will serve classic American favorites and comfort food. It will feature a giant two-story screen, perfect for watching sports and movies, along with miniature bowling, pool and air hockey tables and interactive games. A popular hotspot on several Norwegian ships, Bliss Ultra Lounge has been re-designed on Norwegian Breakaway to resemble a true hotspot, similar to trendy New York clubs. Guests will feel the excitement as they walk through the LED-lit tunnel entrance to the illuminated bar, LED walls and pulsating dance floor where they will dance the night away. 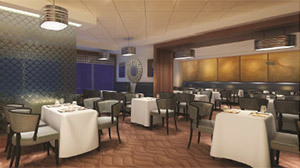 Savor, one of the three complimentary main dining options on Norwegian Breakaway, will feature cuisine that is traditional with a contemporary flair. Across from Savor, is where guests will find Taste, another complimentary main dining venue. Taste will serve a variety of culinary delights to please every palate. 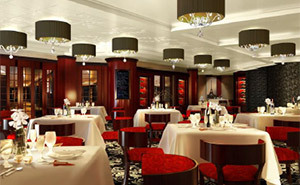 Both restaurants feature clean lines and upscale, contemporary décor. Located between Savor and Taste is Mixx Bar, the perfect, pre- or post-dinner gathering place, with a modern twist to a classical design. Norwegian's signature Teppanyaki restaurant will continue to dazzle guests on Norwegian Breakaway with the addition of a traditional Japanese rock garden, featuring bamboo plants and bonsai trees to promote a pleasing aesthetic ambiance. 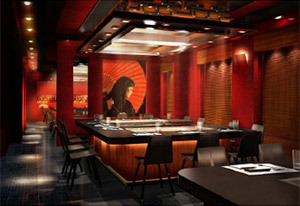 With 96 seats surrounding 12 flat top grills, Teppanyaki chefs will showcase their knife-wielding skills while cooking exhibition-style Japanese cuisine. Guests will be amazed by the masterful chefs while they enjoy an appetizing meal. Le Bistro, Norwegian's signature French restaurant, will feature an elegant indoor setting, along with a European sidewalk-style dining opportunity which will overlook the social hub of the ship, 678 Ocean Place. Guests will marvel at the three-story cascading LED chandelier above them, along with the constant flow of people as they dine on classic French favorites. 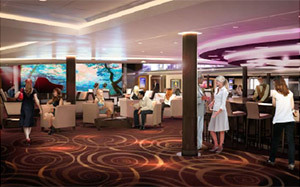 Within the Atrium, located on Deck 6, guests will find a two-story video wall along with the Café and Bar at The Atrium. The Café will offer specialty coffees and fresh baked treats. 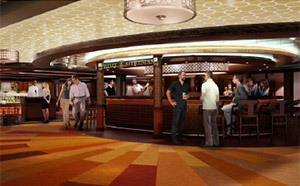 The Bar at The Atrium will feature mixed drinks, along with a self-service wine bar. 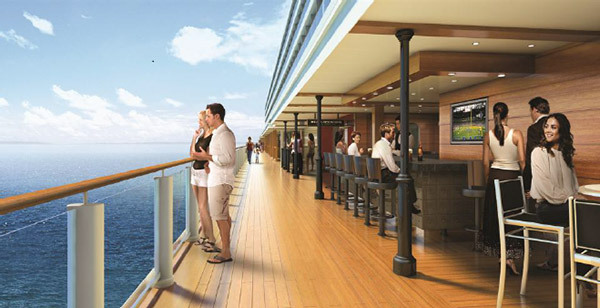 The Shore Excursion Desk, Internet Café and Art Gallery will be located in close proximity to the Atrium, along with two meeting rooms, card room and library. Additional dining options and bars not located within 678 Ocean Place will be announced in late April. There will also be a number of exciting entertainment venues located within 678 Ocean Place that will be revealed at a later date this spring. *One dining venue and one bar will be announced at a later date, along with all of the entertainment venues.